The answer is a Driver Fitting. Make the decision to improve your golf off the tee box. Let us improve your distance, accuracy, and consistency with the right Driver technology and specification for your swing. Before we even get to the ‘loft’, we need to consider how the shaft type and flex, as well as the CoG impact both the launch angle and spin rate of the ball. Trackman launch monitor optimisation charts show that for a regular golfer there can be 15 extra yards by adding just 2° to the dynamic loft and reducing the spin rate by 600 rpm. The height you tee the ball up, the way you set up and the timing of your weight transfer on the downswing will affect the launch angle and spin rate. Again, Trackman launch monitor optimisation charts show that the difference between a golfer with just a 5° negative angle of attack and a golfer with a positive 5° angle of attack is over 25 yards in total distance. For distance, it’s hard to beat speed. Two golfers tested: the second swinging the clubhead at 90 mph, just 10 mph more than the first tester, created nearly 17 mph greater ball speed on centre hits and that translated to nearly 50 yards extra! If you are losing speed then possibly a lighter club and improved aerodynamics will help. If you can swing harder, then a more forgiving clubface will be less punishing on your off-centre ball strikes. The length of shaft has a real impact on the speed of the clubhead but what length works best for you? The clubface angle at impact has the most significant impact on accuracy, but getting the clubhead square is the most difficult challenge. 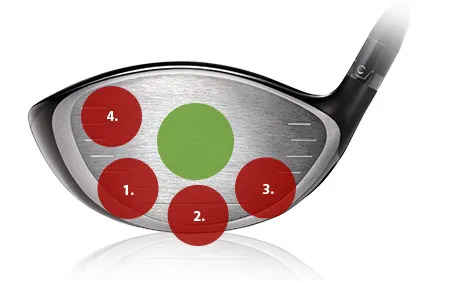 The right technology can help you square the clubface at impact. If you are leaving the face open then there are four fitting areas we can work with: actual clubface angle (possibly a closed face Driver solves the problem); weight in the heel and toe (less weight in the toe may help your hands rotate the club correctly); grip size (possibly your hands are restricted by a grip that is too thick); shaft flex / torque (you may be leaving the clubhead behind on release). To maximise your clubhead speed you need to swing on a good swing path with the clubhead coming from inside to out. Swing path is the one area where the club fitting can be used to minimise a fault, but the biggest improvement can be made if you can learn to swing on plane with the clubhead coming from just inside the target line. That’s why it’s always worth having your swing critically appraised before buying equipment. There may be small changes in setup and alignment, the backswing and the first movement of the downswing that make a very big difference to distance, accuracy and consistency. Why leave those improvements behind? Missing the sweet spot anywhere low on the face has a very poor effect on launch angle, spin and ball speed on most Drivers. Some impact those factors worse than others top right (‘4’) on the face. Where do you miss? ?Some Drivers tested are sensational out of the green sweet spot, but lose up to 9mph of ball speed, 2° of dynamic loft and increase spin rate by nearly a 1000 rpm of spin when hit out of positions 1, 2 or 3. That’s getting on for 60 yards lost. Are you better off with an improved average distance or faster sweet spot? I hope you now have a better understanding of why we are passionate about you having an Assessment, Fitting, and Swing Check when buying a new Driver.